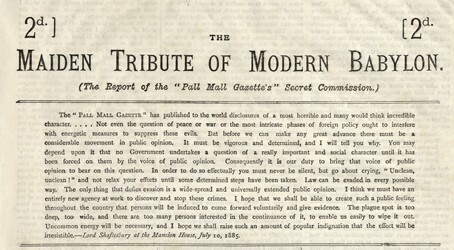 The ‘Pall Mall Gazette’ has published to the world disclosures of a most horrible and many would think incredible character…. Not even the question of peace or war or the most intricate phases of foreign policy ought to interfere with energetic measures to suppress these evils. But before we can make any great advance there must be a considerable movement in public opinion. It must be vigorous and determined, and I will tell you why. You may depend upon it that no Government undertakes a question of a really important and social character until it has been forced on them by the voice of public opinion. Consequently it is our duty to bring that voice of public opinion to bear on this question. In order to do so effectually you must never be silent, but go about crying, “Unclean, unclean!” and not relax your efforts until some determined steps have been taken. Law can be evaded in every possible way. The only thing that defies evasion is a wide-spread and universally extended public opinion. I think we must have an entirely new agency at work to discover and stop these crimes. I hope that we shall be able to create such a public feeling throughout the country that persons will be induced to come forward voluntarily and give evidence. The plague spot is too deep, too wide, and there are too many persons interested in the continuance of it, to enable us easily to wipe it out. Uncommon energy will be necessary, and I hope we shall raise such an amount of popular indignation that the effect will be irresistible. 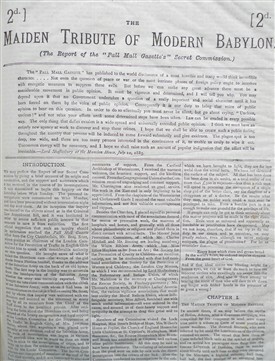 These were the opening lines of WT Stead’s notorious Pall Mall Gazette campaign: ‘The Maiden Tribute of Modern Babylon’ . In three evening editions in July 1885 the paper revealed the existence of 'White Slavery' - organised child prostitution - to a horrified London. 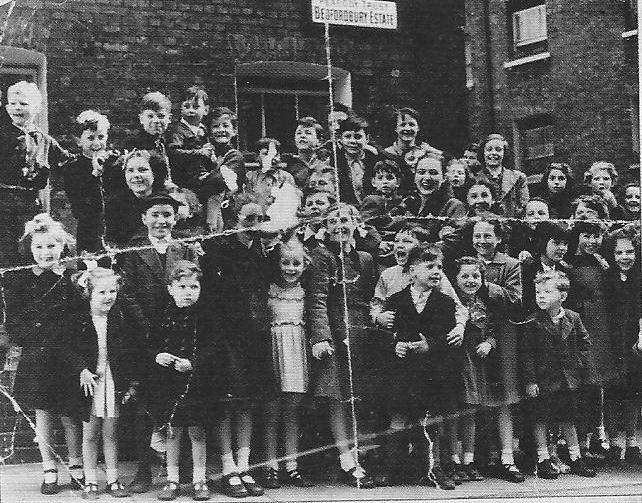 Working with the Salvation Army, Stead exposed the fact that young girls could be procured to order in London by well-heeled clients. To publicise this scandal Stead went undercover in Charles Street (today’s Ranston Street) in Lisson Grove. Advised by a former prostitute, he succeeded in purchasing 13 year-old Eliza Armstrong from her mother (who believed the child was destined for domestic service). The price agreed was £5. Stead then lifted the lid on 'White Slavery'. Posing as a client, he contrived to meet Eliza - given the cover name 'Lily' - at a brothel in Poland Street W1 to prove his point. Stead had his scoop and British newspapers now entered uncharted territory. In an advance teaser piece - 'A Frank Warning' - he grabbed London’s attention. 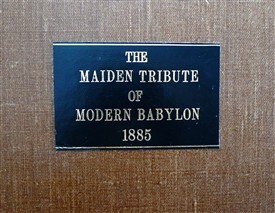 Then, from 6-10 July 1885, the Gazette splashed with a series of salacious, in-depth, articles spelling out 'Lily's' treatment: ‘The Maiden Tribute of Modern Babylon’. Stead likened his expose to the ancient Greek tale of Athenian maidens sent yearly in tribute to King Minos of Crete. Their fate: to be devoured by the bull-headed Minotaur in his winding labyrinth until the hero Theseus slew the beast. This clear analogy to the squalid realities of the Victorian underworld hit home. The articles caused a popular sensation. London ('Modern Babylon') was shocked by the details. The Gazette’s offices at 2 Northumberland Street WC2 were besieged by a crowd of thousands seeking copies. Stead - styling himself as a new Theseus - justified his methods, demanding that the legal age of consent be raised from 13 to 16. But pushing back the envelope of the era’s acceptable journalism came at a price. Because he had gained Eliza’s mother’s permission alone - rather than her father’s – Stead had broken the law as it then stood. Along with five others he was arrested for kidnapping. Convicted at the Old Bailey – for the same crime he had exposed – Stead was imprisoned for three months in Holloway Prison. He continued to edit the Gazette from his cell. There were happy consequences. Under pressure from public opinion, the new Salisbury administration carried The Criminal Law Amendment Act (1885), increasing the age of consent from 13 to 16 (it promptly became known as ‘Stead’s Act’). 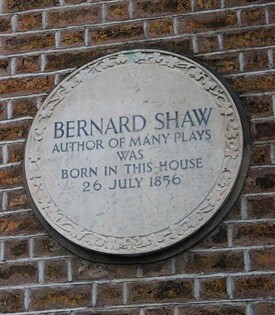 George Bernard Shaw would later draw on aspects of the Armstrong case as material for his play Pygmalion (1912). This page was added by Ronan Thomas on 14/11/2012.